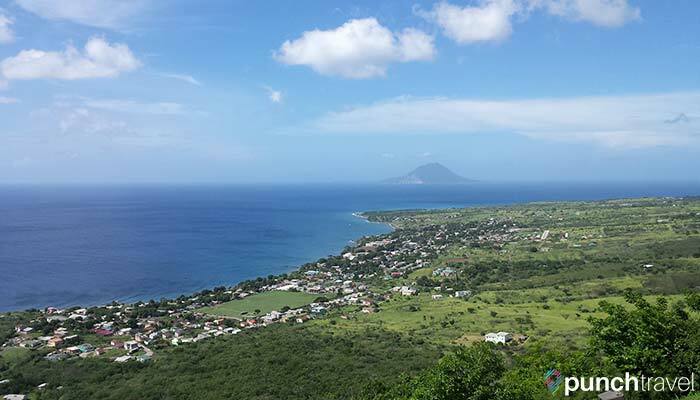 After touring Saint Kitts for a day, our visit continued to include a day at the island of Nevis, the smaller island of the two islands that make up Saint Kitts and Nevis of the British West Indies. Nevis (pronounced knee-vis), is undoubtedly remote, but this remoteness is what has preserved this island as an untouched haven within the Caribbean Islands, and as an exclusive retreat for those seeking solace from the limelight. From St. Kitts, we took the local ferry to Nevis, which operates a few times a day. The ferry terminal in St Kitts is located further down past Port Zante, and there are several food stalls in the area to grab a snack for the ride. A one-way ticket to Nevis costs $11, which includes a departure tax. The ferry ride took about 45 minutes, and it was a pleasant ride along the coast of St. Kitts island. Once arriving at the smaller island of Nevis, there are several taxis waiting at the port, which is located in the main town of Charlestown. In this commercial center, there are banks, administrative buildings, as well as the Alexander Hamilton Museum. One of Nevis’ claim to fame is that it is the birthplace of Alexander Hamilton, one of the United States’ founding fathers. The museum is located where his house once was, and it is somewhat small and rudimentary. You may want to skip it but if you find yourself in Charlestown, it may be worth walking by and checking out the placard that is posted outside. From Charlestown, we arranged for a taxi tour around the island for $100, which in hindsight seemed a little steep. Our driver first took us to The Botanical Gardens of Nevis. For $13, you can spend your time strolling through over 6 acres of grounds home to hundreds of different types of plants, trees and flowers. 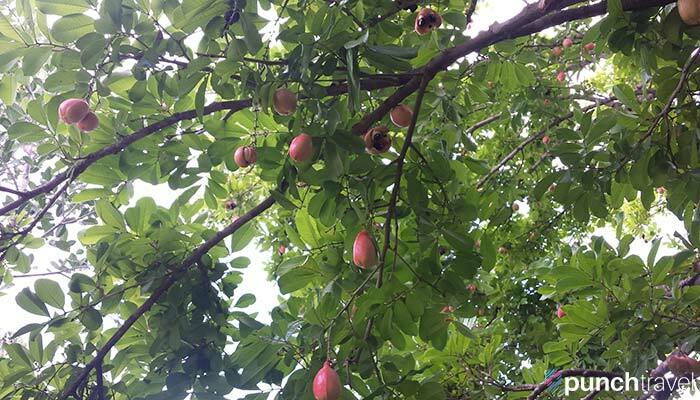 Different sections of the garden are devoted to different families of plants, like the orchid garden, the tropical fruit tree garden or the cactus garden. There is a rainforest greenhouse in the center of the property with many tropical plants, as well as two talkative parrots. We took a break here to have lunch at the Oasis Thai Restaurant located above the gift shop. 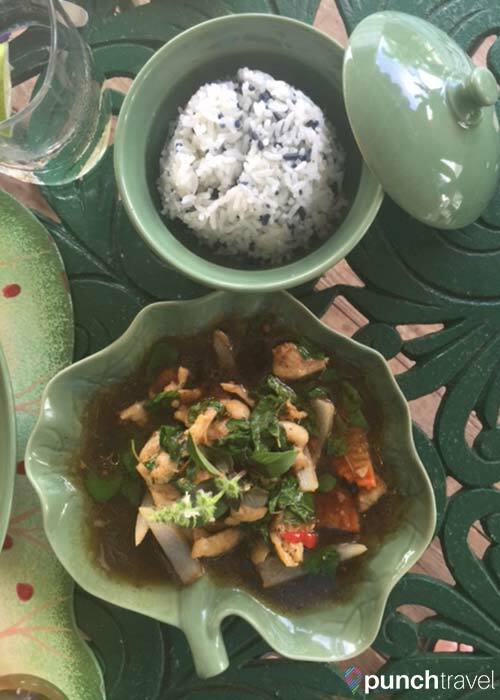 With panoramic views of Nevis, it was a perfect backdrop to our authentic Thai lunch, which included Thai iced coffee (my favorite! 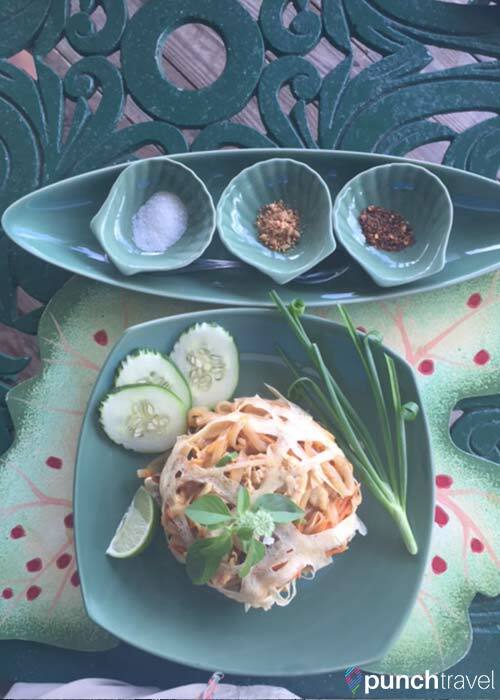 ), blue rice as well as pad thai served with the traditional accompaniment of sugar, chili flakes and peanuts. After lunch, our driver took us to a few of the notable plantations on the island, most of which have now been converted to resorts. Montpelier Plantation Inn: This resort was made famous because it was where Princess Diana once stayed to escape the media, and is now part of the Relais & Châteaux group. Upon entering the resort, there is a large tree at the entrance which was planted in the 1960s and has now grown to a massive size due to the nourishing tropical climate. Be sure to also check out the unique private dining space situated inside an old mill. Hermitage Plantation Inn: Another unique resort, the Hermitage consists of several gingerbread-style houses that were dutifully restored and brought to this piece of land in the jungle. The Great House, where the restaurant is located, dates back to 1670. 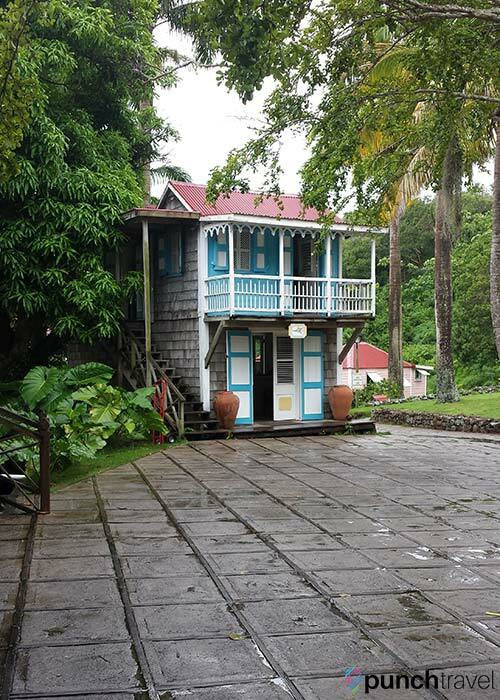 Golden Rock Plantation Inn: Nestled deep in the jungle is the Golden Rock Plantation Inn, with eleven guest rooms which offer privacy and a place to relax. 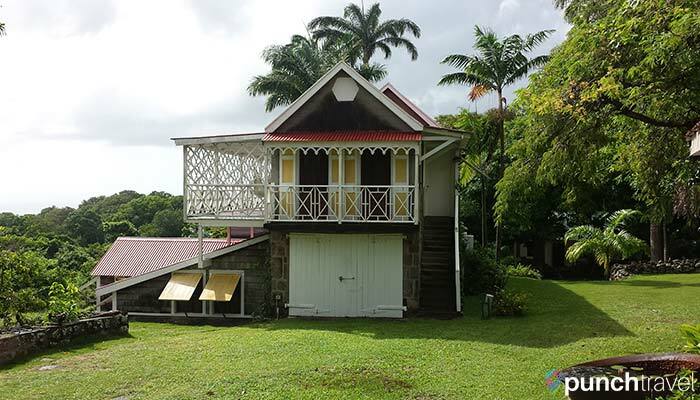 Walk through the garden of the grounds which are nestled among the ruins of the former plantation. 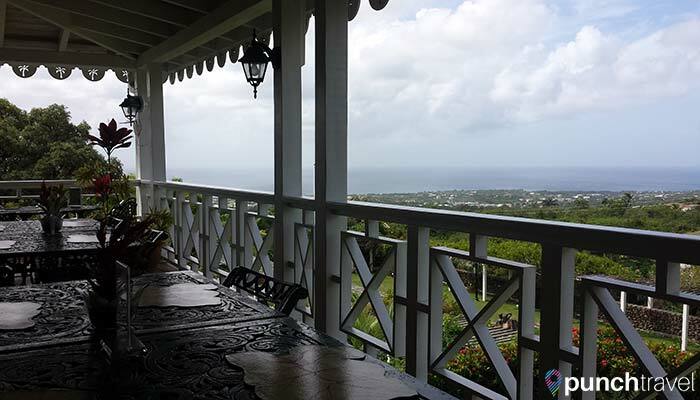 Nisbet Plantation Inn: This resort boasts itself as the only historic plantation inn that is located on a beach. With over 30 acres of property, the 36 guest houses offer your own piece of Caribbean paradise. On the beach, you’ll find a beach bar, hammocks and lounge chairs for your enjoyment. Gingerbread houses form the Hermitage Plantation Inn. The gift shop at the Hermitage Plantation Inn. All around the island, we passed many ruins of old sugar plantations, including the Eden Brown Estate, which is rumored to be haunted by its former resident. 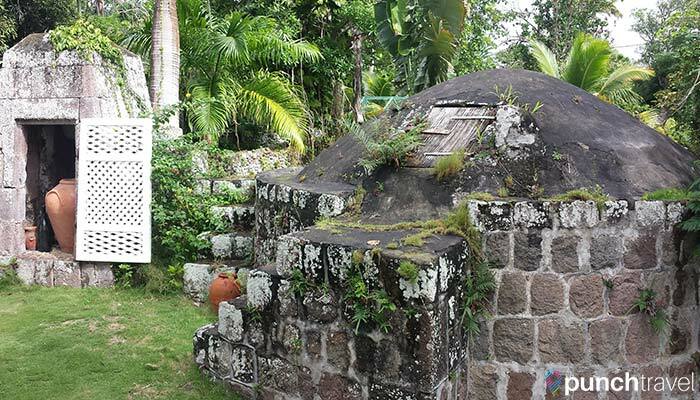 These bygone memories of what was once the thriving industry that Nevis’ economy primarily depended on, has now been replaced by offshore banking, citizenship-by-investment and tourism. Like most of the Caribbean islands nowadays, the resorts and cruise ships provide an influx of visitors, money and employment to these beach towns. If you get a chance, explore outside of the commercial cruise ports and main streets to get a glimpse of this beautiful island. Enjoy the richness by venturing off the beaten track. Have you been to Nevis? What were some of your favorite things to see? Let us know in the comments! Grace is a blogger, digital and content marketer, and co-founder of Punch Travel. She has been living and traveling outside the US since 2015 and has logged over 350,000 kilometers since she started counting. She loves to try local dishes and isn't embarrassed to bust out a selfie stick. You can find her on Twitter @PunchTravel or Instagram @PunchTravel. Punch Travel is a travel, food and lifestyle website that provides destination information, travel tips and hotel, restaurant and attraction reviews. Contact us here or join the conversation below.